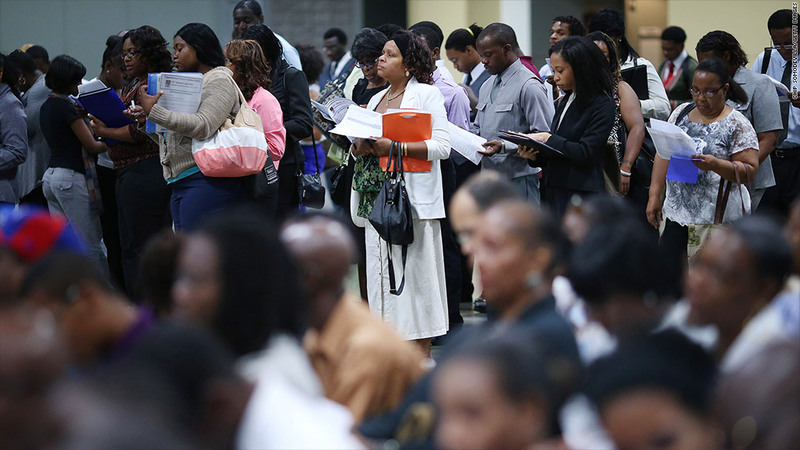 The nation's jobs gap stands at 9 million eight years after the recession began. America has added 5 million jobs since February 2010, when employment hit its Great Recession low. But the nation still needs to add another 9 million jobs just to get back to pre-recession unemployment levels, according to data crunched by the Economic Policy Institute. While that is a pretty big number, the jobs gap is starting to shrink as the economy picks up steam. A year ago, the deficit was 10.3 million jobs. And in September 2010, it was 11.3 million. "We've reduced the gap, but it's still massive," said Heidi Shierholz, an economist at the left-leaning Economic Policy Institute. The improvements in the economy shouldn't mask the continued weakness of the labor market, Shierholz said. There is still a lack of demand for workers, with 3.8 million fewer jobs in the labor market now than before the recession. On top of that, the labor market should also have added another 5.2 million jobs by now just to keep up with the growth in the working-age population over the past five years, Shierholz said. To eliminate the jobs deficit over the next three years, the economy would have to add 330,000 jobs a month -- twice the rate it is today. At the current pace, it would take until mid-2020 to get back to an unemployment rate of 5%, which is where it was in December 2007. The unemployment rate was 7.9% last month. "Let's not forget how far we have to go," she said. "We're in a big hole."